Snowpack Summary for Saturday, March 23, 2019 9:34 AM Warming trend with wet slide potential. Scholarship Fundraiser March 30! Overall: Human triggered wind slab avalanches may be possible in steep isolated terrain above 11,000'. Sun exposure and warm temperatures may destabilize slopes, producing wet slide potential especially on south aspects. New precipitation March 21 and 22 delivered 16" of snow with strong south and southwest wind. Overall the snowpack structure exhibits a wide variety of characteristics based on aspect and elevation. At treeline on N, W and SW aspects, the snowpack has moderate strength, poor to moderate structure and low to moderate energy. No significant avalanches or unstable snow reported since February. Backcountry conditions are dynamic, and can change rapidly, especially in spring. Pay attention to changes in snowfall, wind and temperature and how those changes affect the snowpack. Spring skiing entails monitoring overnight temperatures and what elevation freezing occurs and for how long. Saturated conditions are indicative of wet slide hazard. Spring is here and it is time to adopt spring travel strategies. Near and Above Treeline:Watch for new wind slab development and growing cornices on leeward slopes. 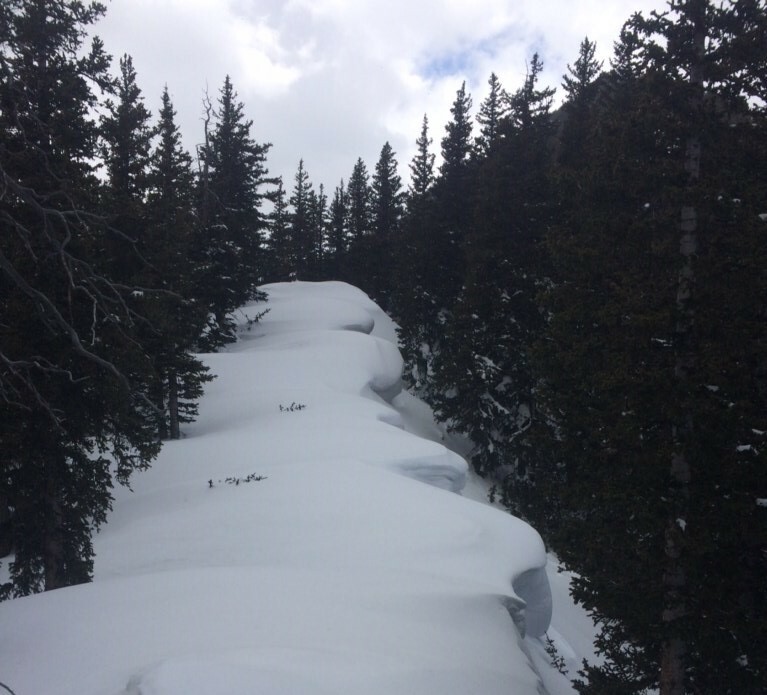 Skier triggered wind slab avalanches may be possible above 11,000 ft. Some isolated and steep terrain may contain touchy slabs that are more likely to be human triggered. Expect to find wind scoured zones and hard icy snow above treeline. Crampons and ice axes will help prevent falls on steep icy slopes. Sunshine after storms may destabilize new storm/wind slabs, primarily on southerly and sunny slopes. Below Treeline:Coverage is good to excellent on most slopes above 9000', with plenty of safer low angle (<30°) touring. Watch for steep sunny slopes becoming unstable with warming temperatures. Human triggered wind slab avalanches may be possible above 11,000'. Some isolated and steep terrain may contain touchy slabs that are more likely to be human triggered. Sunshine and warm temperatures may destabilize new storm/wind slabs. Winds are light and variable depending upon location. Expect wind directions to change. Wind slabs are often smooth and rounded and sometimes sound hollow, and can range from soft to hard. Avoid slabs and convex pillows of wind-drifted snow on lee and cross-loaded terrain features. Waiting at least 48 hours after wind events will decrease your chances of finding unstable storm/wind slabs. Above freezing temperatures and sunshine may saturate and destabilize sun affected slopes. When the sun is out, expect new storm and wind slabs to become wet on southerly and sunny slopes. The new wind/storm slabs rest on icy melt/freeze crusts, which may become a sliding surface for a wet slab. Avoid traveling on and below steep sun affected slopes after midday, earlier on very warm days. Rain on snow events may also lead to wet slab releases. Cornices can form along ridgelines and cross loaded features. Ridge between Reese and Abineau Canyons with crossloading from southwest winds. Snow depth 300 + cm. Credit Tanner Porter. Join us Saturday afternoon, March 30th at the Agassiz lodge for our annual Mikee Linville Backcountry scholarship fundraiser. We have lots of great prizes! Logging work will start in the near future along the first 1/4 mile of Freidlein Prairie Road (FR-522). Loggers will plow that stretch of road and need gate access. This is part of the Chimney Springs thinning project. The last seven days gave us a taste of spring early in the week, and then a return to winter with some snow and cool temperatures. On Thursday March 21 we had a little thunderstorm action. Snowbowl reported 10” of new on Friday morning March 22 and a total of 16” over the recent storm cycle. Strong winds out of the southwest and west blew on Thursday afternoon and evening. Snow showers from a departing closed low pressure system may linger through the day on Friday March 22 potentially adding a little more snow. Friday evening should bring clearing conditions. A gradual warming trend will commence on Saturday and continue throughout the early workweek. The extended forecast calls for dry conditions, partly cloudy skies, and breezy afternoons with near normal temperatures. Maximum temperatures on San Francisco Peaks will exceed the freezing point throughout the week. It will start to feel like spring has actually arrived. On Friday, March 22, the Inner Basin SNOTEL site (Snowslide) reported a snow depth of 74” (188 cm) at 9,730 feet. Arizona Snowbowl reported a settled base of 98” (250 cm) at 10,800 feet. So far this winter, 323" (820 cm) of snow has fallen at the mid-mountain study site. Since March 15, SNOTEL temperatures have ranged between 3°F on March 15, and 44°F on March 17 and 19. At ASBTP (11,555') the reported temperatures were between 9°F on March 15, and 41.5°F on March 19 over the last week.